St Barths is a luxury holiday holiday destination that is definitely worth exploring if you are looking for a certain ‘je ne sais quoi’. A French influence pervades the chic and stylish island, noticeable as you dine on gourmet food, shop in exclusive boutiques, mingle with the rich and famous and explore one of the most beautiful Caribbean islands. 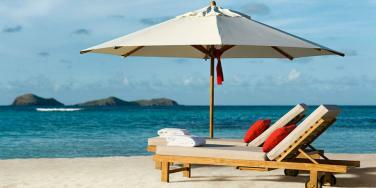 Call our travel specialists on 01752 880 880 to discuss your holiday to St Barths. Our friendly team has extensive knowledge of the Caribbean islands and has visited each of the hotels that we offer. This enables us to provide expert advice and to tailor make the perfect holiday for you, whether you are looking for a luxurious resort or a boutique gem. Tropic Breeze is a specialist tour operator offering fully bonded and protected holidays with ABTA or ATOL, meaning you can rest assured that your holiday is safe and secure. St Barths was in the path of recent hurricanes so unfortunately some of our partner hotels and resorts have sustained some damage. As tourism is such an important industry for St Barths, we will continue to support our travel partners and are hopeful that all hotels that have been affected will be able to repair and rebuild quickly - please call our friendly team on 01752 880 880 if you have any questions about future travel to St Barths. St Barths (short for Saint-Barthélemy) is an exclusive island with dramatic mountains, picturesque beaches and turquoise bays with moored yachts. As well as stunning scenery and uncrowded beaches, St Barths is also home to outstanding restaurants and some of the finest luxury hotels in the Caribbean. It has recently become easier to reach this luxury Caribbean island with daily flights now available from Antigua with Tradewind Aviation. Call our travel specialists on 01752 880 880 to discuss your holiday to St Barths or browse the accommodation options below.